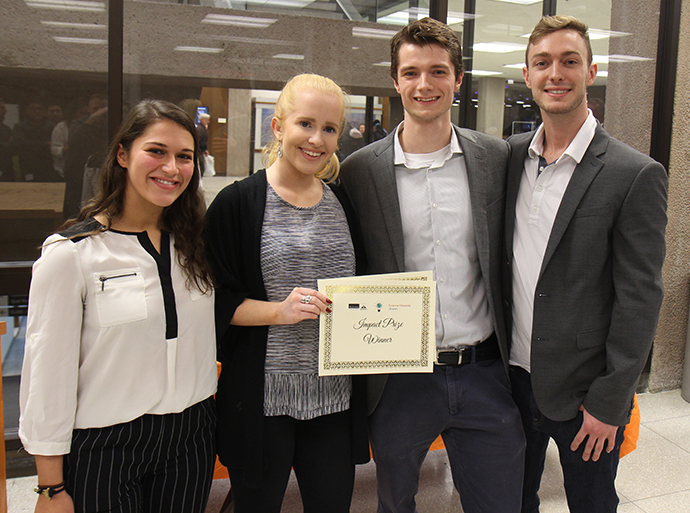 Student startup companies developed during the Invent@SU invention accelerator program took the top two prizes at the 2018 Syracuse University Impact Prize Competition organized by Blackstone Launchpad. The winners were selected for presenting the most innovative and implementable ideas to help solve civic, environmental, economic or other public challenges as part of a campuswide social entrepreneurship challenge. MedUX, invented by industrial design students Quinn King ’20 and Alec Gillinder ’20, won first place and $6,500 in funding. Their wearable, portable IV system allows patients to remain mobile while receiving treatment. King and Gillinder also won the SU Campus session of Invent@SU in the summer of 2018. Prioritage, invented by bioengineering major Angelica O’Hara ’19 and biochemistry major Ibnul Rafi ’18, took second place and $3,500. Their device, a system for first responders at mass casualty incidents, measures vital signs of multiple patients through armband units that relay data to a central onsite monitoring device. O’Hara and Rafi won first place at the New York City session of Invent@SU in the summer of 2018. McKenna Murtha ’19 of Newhouse has also joined the startup company. Invent@SU teams Halo and FitPet were also finalists for the Impact Prize. Halo is a discreet personal safety alert device designed for college campuses, and FitPet is a pet health monitoring system. This is the second year in a row that Invent@SU teams have finished at the top of the Impact Prize competition. In 2017, wearable asthma inhaler In-Spire and microfiber trapping device FibreFree were the first place teams.